Alarm time. Free Alarm Clock uses the time format defined in the Windows settings. You can set one-time alarms or repeating alarms. Click on "Repeat" group if you want your alarm to go off on multiple days. Determine whether you want your alarm to go off "Every Sunday," "every Monday," or every day. Free Countdown Timer. You can use it together with Free Alarm Clock. Label different alarms to indicate activities you must do at the sound of the alarm. If you uncheck this checkbox, a tooltip with the event's description will be displayed in the bottom right corner of the screen. 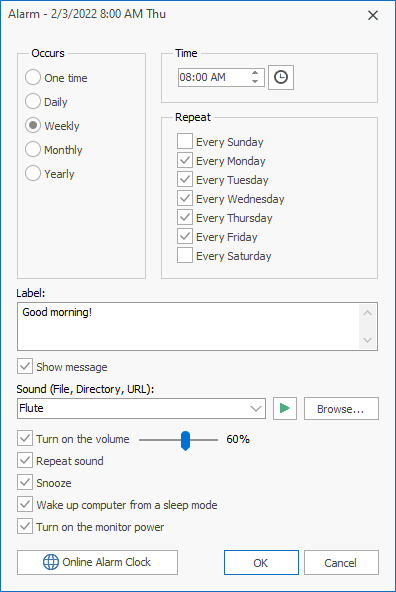 You can stop the music by clicking Free Alarm Clock's blinking icon in the system tray. Or, if the clock in floating window is visible, click it to stop the music. Concurrent alarm clock events produce only one notification and alarm. Select the sound you want to wake up to. You can adjust alarm sound by pressing "Browse" button. The alarm clock comes with several sounds and offers full access to your music library. When the time comes to activate your alarm, the program will set alarm volume to a predefined level. If you muted the sound or decreased the volume, Free Alarm Clock will unmute the sound and, if necessary, increase the volume to wake you up. If you don't like that, just uncheck the checkbox. 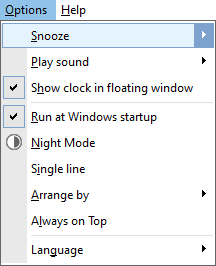 Activates the "Snooze" feature on your computer. Automatically launch Free Alarm Clock when the system is started. This setting allows you to set the amount of time before the alarm rings again (snooze). This setting allows you to define for how long to play the music. Floating window is a small, special window that displays clock. This option lets you display rows in the list in a special way: Each row will become smaller in height and will contain only one line. The font size for displaying time will be reduced. If you set this option, the main window will be placed above all non-topmost windows, and will stay above them even when deactivated. Free Alarm Clock's interface language. 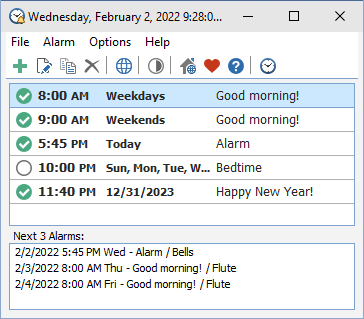 If you need alarm clock software for Windows-based computer, this is the software you are looking for. Free Alarm Clock supports unlimited number of alarms so that you are not restricted to the number of alarms you can have. ඔයාලගේ වටිනා අදහස් මේ පොස්ට් එකට දාන්න අමතක කරන්න එපා!!! !